A human rights nonprofit has purchased billboard space in New York City’s Times Square as part of a campaign to refocus discussion on North Korea. The organization hopes that the ads will help shift the discussion around the isolated nation from one primarily based on security to one that focuses on the people and human costs of the country. “Our greatest fear is a trade-off of human rights versus political security concerns. We know that is not the answer,” Greg Scarlatoiu, HRNK’s executive director, told NBC News. Established in 2001, HRNK has published more than 30 reports about human rights in North Korea, including one that documents personal accounts of female defectors and several that analyze the country's political prison camps. 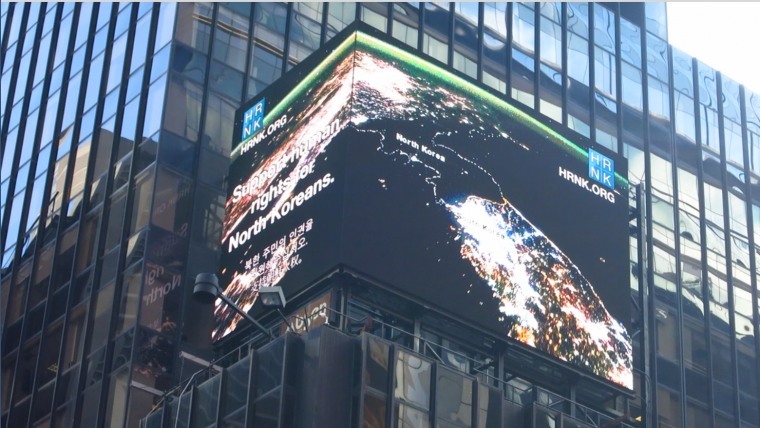 In addition to the ads in Times Square, HRNK is preparing to release a series of reports about North Korea's prison system, North Korean workers who are dispatched overseas, and the status of children in the country, among other topics. The first is scheduled for release by early October. "This [billboard] is just going to be the tip of the spear," Scarlatoiu said. Other facets of the campaign will include conducting public outreach in Washington, partnering with human rights organizations, and hosting conferences that shed light on the situation in North Korea, Scarlatoiu said. A North Korean escapee granted anonymity because they still have family in North Korea told NBC News that one of their family members who owned a business in the country had been interrogated and tortured by the government for several months, causing the business to suffer. The escapee pursued higher education outside of North Korea in an effort to help revive the business, but has been unable return home, they said. HRNK estimates that approximately 400,000 have died in North Korea's prison camps and millions in the country experience food insecurity. In the month that the billboard has been displayed in Times Square, HRNK has seen interest in the campaign on social media and a rise in first-time donors, Rosa Park, the organization’s director of programs, said. The area sees upwards of 300,000 pedestrians per day, according to the Times Square District Management Association. “People are tagging their friends to share the billboards with them; others have said it's a great initiative, and we've only seen positive comments so far,” Park said. The ads are scheduled to run for a total of three months and cost $20,000, according to Scarlatoiu. The organization will evaluate continuing them based on the financial support the organization receives from the campaign.